Clark University’s Razzo Hall was filled to capacity Friday November 12th for the East Coast premier of Ciclovida: Lifecycle, a documentary by local filmmaker Matt Feinstein. The documentary follows the daunting trek of a group of landless peasant farmers in Brazil as they bike over 6,000 miles across South America to Argentina. Their mission: combating the takeover of genetically modified seeds and reclaiming a sense of tradition and solidarity with each other and the environment. 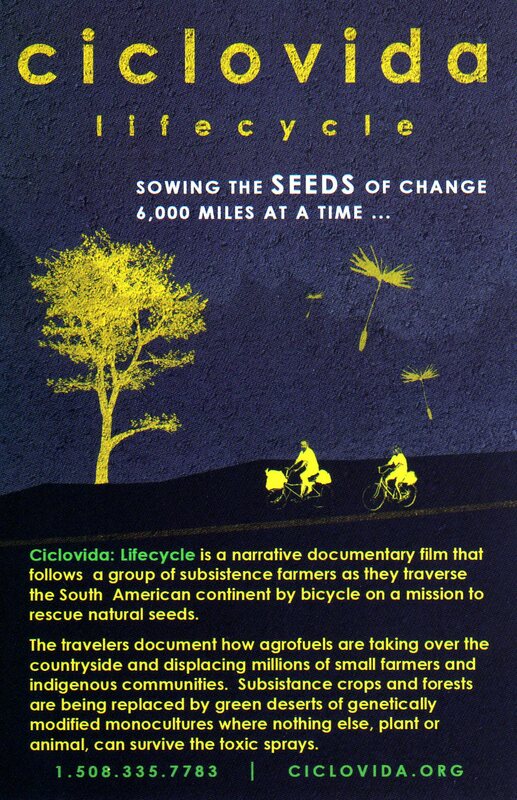 Director Matt Feinstein introduced the film with hopes that the screening would, “give this documentary a chance to affect other communities.” Ciclovida is an inspiring narrative of one group’s specific example, but it is also captivating due to its world-wide sentiment. Ciclovida focuses on two of the cyclists in particular, Inacio and Ivania. They are friends, lovers, and comrades who band together on the amazing journey despite having to leave loving families, endure harsh conditions, and face the odds against them. The primary metaphor in the documentary is the natural process of cycles. Throughout the film Inacio and Ivania explain their part in the connection of life’s cycles. Their journey propels the natural and traditional cultivation of seeds, their bicycles allowing them to carry on this time-honored practice. Births and life’s events carry on around them as they continue their mission of growing natural plants, and their group links together to make their trek possible. As the team narrates throughout the film, while on the road, they are always able to find communities who share the same worry for South America’s state of agriculture and who also share the same respect for natural processes being compromised. The rainforests, fishing spots, crops, and livestock that the group encounters on their way are all facing an alarming and threatening change from industrial agriculture popping up across the country. Metal factories, herbicides, and bio-diesel are becoming a constant threat. One elder woman they meet on their way explains the changes in her children’s health. She says that prior to these new pressures on the environment, she was able to raise healthy offspring without the need to visit the doctor. Now, she says, it has become impossible to raise children without it. In many cases, people living in poor, rural areas of South America cannot get to the doctor or cannot afford the visit. Other deaths have happened due to herbicide poisoning and other contaminants. Sadly, death is also a part of Ciclovida’s metaphor of cycles. Another hardship the cyclists must face is the separation from their families. As Inacio and Ivania tell in the documentary, it is because of the love they have for their families that they are doing what they do. This, however, does not ease the pain that they feel leaving their children, relatives, and community members for months on end. Ivania, mother of three boys, seems to feel it the hardest. She talks about the sexist undertones in her culture that bring her such guilt. Leaving one’s family for a social and environmental cause has no place in a culture where Ivania is expected to stay home and care for her children and be wholly obedient. While the documentary focuses on a very heart-wrenching tale of injustice, ecological degradation, and emotional and physical pain, Feinstein does a good job of balancing these themes with some uplifting scenes. It’s clear throughout Ciclovia that these individuals are held together with love, selflessness, and compassion. The mindset behind their epic journey is truly heartfelt. “It was so great to see the audience react to the humor, to the successes in the arrival, and have thoughtful questions and comments afterwards,” Feinstein said. “This was our first large screening of the documentary, and grassroots shows like this are really important.” The event raised $1,200 which will be used to fund windmills for Ciclovida’s seed garden and Brazilian film distribution. Feinstein’s other endeavors include the Stone Soup Community Resource Center, the Worcester Roots Project / Toxic Soil Busters Co-op, and the Worcester Immigrant Coalition. To find out more about Ciclovida: Lifecycle, visit ciclovida.org. This entry was posted on Monday, November 15th, 2010 at 6:22 pm	and tagged with bicycle, brazil, ciclovida, clark, cycle, documentary, environment, environmental, film, lifecycle, ma, matt feinstein, university, worcester and posted in Uncategorized. You can follow any responses to this entry through the RSS 2.0 feed.